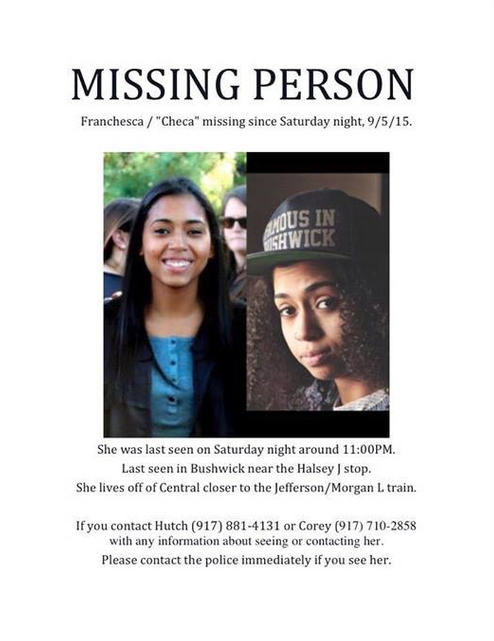 We've been asked by friends of Franchesca, aka Checa, to spread the word about her disappearance. Checa, 24, a Bushwick resident went missing on Saturday, September 5. She was last seen at around 11PM near the Halsey J stop. Checa is 5'5 tall. The police has been notified, and her friends are concerned as they cannot find a reason for her to be missing. In case you saw Checa or you have any information, please the police immediately.